QNAP had on display the world's first Thunderbolt 2 NAS unit. 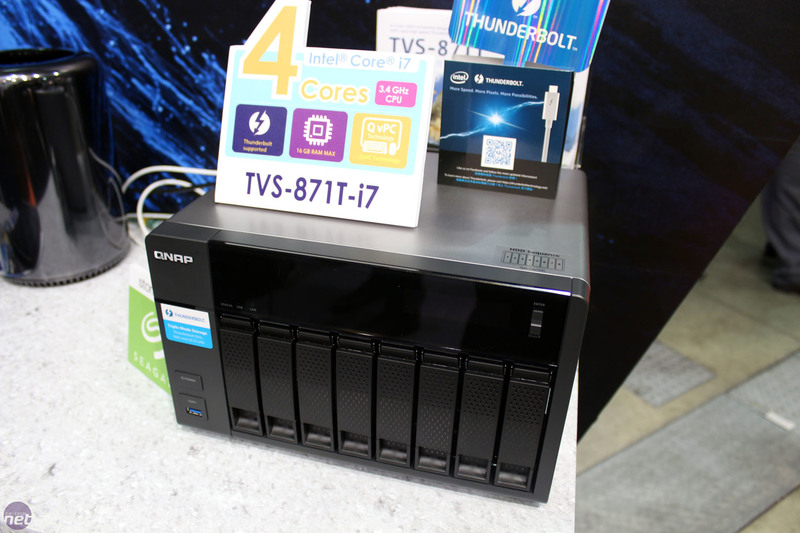 Equipped with two of the 20Gbps ports (four times faster than USB 3), as well as two Intel-based 10Gbps Ethernet ports and four Gigabit Ethernet ports, the TVS-871T has eight SATA 6Gbps HDD bays and is designed for audio and video professionals. Such users often use Apple Mac computers, which come with Thunderbolt connectivity (and not Ethernet) built in. Using the TX-800P or TX-500P expansion units (also Thunderbolt 2 equipped), you can daisy chain up to six units for a whopping 448TB of raw capacity. The unit packs a fair bit of computing power thanks to its Intel CPU – you can opt for the Core i5-4590S or Core i7-4790S – and 2 x 8GB of DDR3 memory. Extra features include three USB 3 ports (one front, two back); and two rear USB 2 ports. The unit is cooled by two 120mm fans and measures 298mm x 235mm x 185mm (W x D x H). The company demonstrated transferring a large 4K video file (over 30GB) using Thunderbolt 2, and it was done in just over 30 seconds, with peak speeds reaching 955MB/sec. QNAP was also demoing its new search functionality, Qsirch, designed to make trawling through massive media collections fast and simple. All we can say from our quick hands on is that it did seem to work very fast, with near instant results as you typed. It features category based searching and a unique algorithm to predict your search as you type. 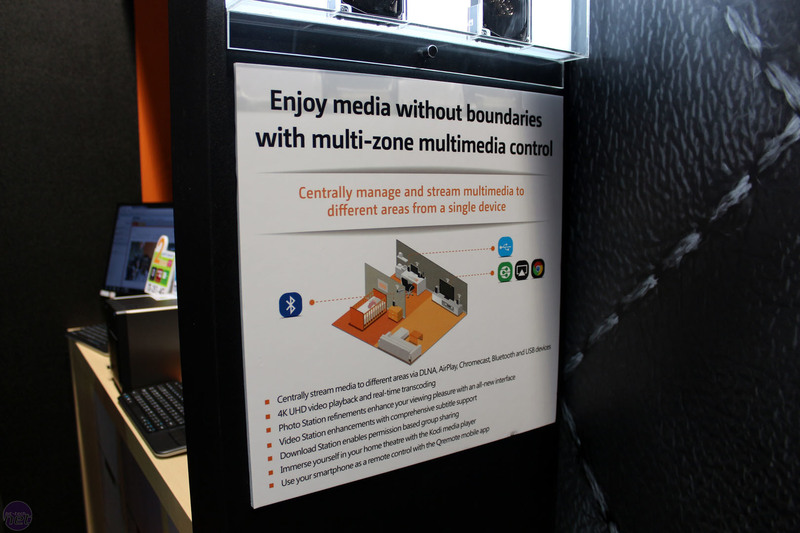 Finally, QNAP is also bringing about improvements to its media streaming, allowing easy multi-room, multi-device streaming of photos, videos and music, as outlined in the picture above.